In the background of this photo, taken in 1910 in Schenectady New York, the exotic animal menagerie is being consumed by fire as bystanders hurry from the scene. It was common practice in the old days to "waterproof" the canvas tops by brushing liberal coats of a mixture made of paraffin and gasoline on them at regular intervals when needed. It kept the audience and performers dry as toast but unfortunately it turned the heavy cotton canvas duck cloth and manilla hemp rope tops into incendiary bombs that could be touched off by anything from a hot cinder from a cook house stove or passing train to a wanton cigarette ash. 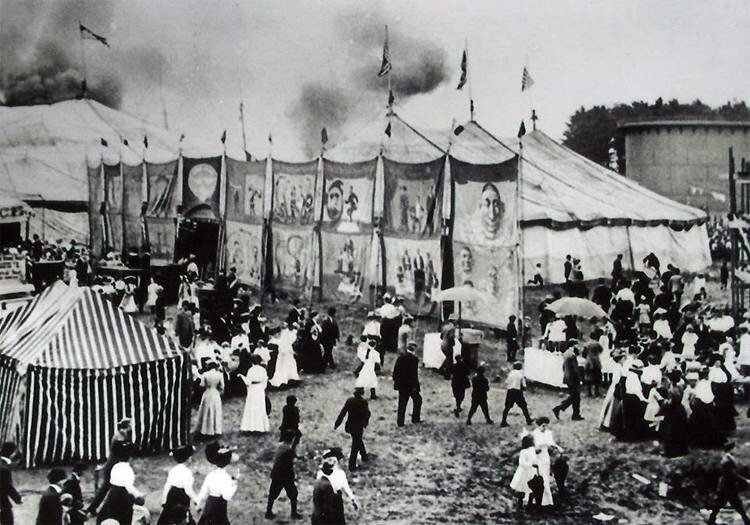 The most memorable and well publicized of these fires was the terrible Hartford Connecticut tragedy that signaled the end of "Big Bertha" the mighty canvas big top of the Ringling Bros Circus, forever.